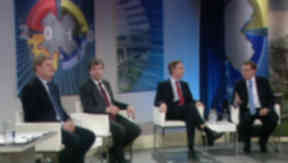 Politicians from the four main parties at Westminster clashed over recession, defence, expenses and coalition threat. Figures from Scotland's main parties have clashed over how to improve the economy and Westminster's expenses scandal in a historic STV debate. SNP Westminster leader Angus Robertson described the issue as "the most important question in the election", saying: "The most important way to reduce the debt and the deficit is to ensure there is still growth in the economy. "That`s why I`m very concerned about things like a rise in National Insurance, a tax on jobs, a tax on success that will undermine the recovery we`re hoping we are beginning to see and might pitch us back into a double dip recession." However, Scottish Secretary Jim Murphy argued savings could be made in welfare. "I think we could be much more ambitious about cutting the cost of welfare," he said. "I genuinely think it should be a rule of our country that you should never be better off on benefit than you should be in work. I want to see much greater effort in getting people into work." Jamie Livingstone: Who would do a deal in a hung parliament? STV's Scotland Debates, chaired by broadcaster John MacKay, saw the four politicians answer questions from a cross-section of voters. Alistair Carmichael, Scottish spokesman for the Liberal Democrats, and Conservative shadow Scottish Secretary David Mundell were also taking part. The hour-long televised event, from the Piping Centre in Glasgow, covered a range of issues, including the economy, MPs' expenses, military action in Afghanistan and Iraq and the possibility of a hung parliament. Alistair Carmichael spoke about the expectations surrounding the general election on May 6. He said: "I have never known an election to be so exciting." Much of the debate was dominated by the expenses scandal that rocked the last parliament. The panelists were asked if any MPs who had profited from having a second home should pay back any money they made. Of the four speakers, only Mr Robertson said MPs who had made money from "flipping" their mortgage from one property to another should be forced to return the money. He called the practice a "scandal". Mr Murphy apologised "on behalf of all politicians" for the expenses scandal, while Mr Mundell condemned politicians for failing to implement past legislation governing the ways politicians claimed back their expenses. Mr Carmichael called for the public to be given more "control" over politicians at Westminster: "We have to have a clean new system in place and we have got to give the people back more control over their politicians." On the wars in Afghanistan and Iraq, Mr Robertson called on Labour and the Conservatives to be "honest" about when British troops should be withdrawn from both countries, but the other candidates agreed that no timetable could yet be set. Mr Murphy was the only member of the panel who supported the wars in Iraq and Afghanistan - but he admitted that the government made "catastrophic" mistakes in the way they dealt with the aftermath of the Iraq invasion in 2003. The debate also focused on the possibility of a hung parliament, with questions asked over who would form a coalition with whom. Mr Carmichael said: "If the decision of the British people is that they don't want any individual party to have an overall majority in the House of Commons then I will talks and try and work with anybody who is prepared to put the national interest first." Mr Murphy said he had tried to work with politicians from all parties since becoming Scottish Secretary, adding: "There is too much squabbling in politics." He told the audience he would "try to build bridges and consensus" where possible. Mr Robertson said a hung parliament would be the best outcome for the election because it "would force parties to work together", adding: "I actually think in an economic downturn, where we have a need to fix our political process, we need that. We need that bringing the parties together to reform a whole series of things." However, Mr Mundell warned a hung parliament could be "unstable" and argued: "In this time of recession we won't get the clear decision making that we need."